Erik Prince appointed a new president and chief operating officer in a management shake-up he said was part of the company's "continued reorganization and self-improvement." 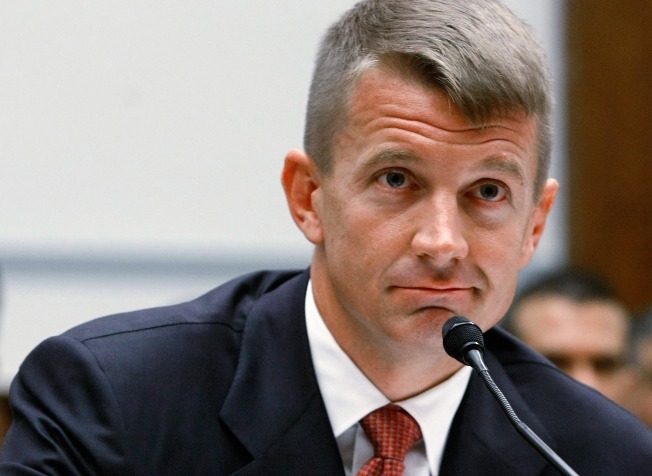 Erik Prince, the founder of Blackwater who used an auto parts inheritance to build the security firm into one of the world's most respected — and reviled — defense companies in the world, said today he has stepped aside as chief executive. Prince appointed a new president and chief operating officer in a management shake-up he said was part of the company's "continued reorganization and self-improvement." It comes just a couple weeks after changing its name to Xe, pronounced like the letter "z," in an effort to repair its severely tarnished name and reputation. "As many of you know, because we focus on continually improving our business that Xe is in the process of a comprehensive restructuring," Prince wrote in a note to employees and clients. "It is with pride in our many accomplishments and confidence in Xe's future that I announce my resignation as the company's Chief Executive Officer." Joseph Yorio, recently a vice president at DHL and a former Army special forces officer, will serve as president, replacing retiring executive Gary Jackson. Danielle Esposito, who has worked within Xe for nearly 10 years, will be the new chief operating officer and executive vice president. Prince, who will retain his position as chairman of the company but remove himself from the day-to-day operations, founded Blackwater in 1997, initially to provide training to law enforcement and military. But after Sept. 11, the bombing of the USS Cole and the start of the Iraq War, the company built a large presence in providing private security. The company's lucrative contract to protect U.S. diplomats in Iraq comprises about one-third of Xe's revenues, but the State Department announced it would not rehire the firm after its current contract with the company expires in May. The company has one other major security contract, details of which are classified. Prince said in a January interview that losing the contract would be damaging. "It would hurt us," Prince said at the time. "It would not be a mortal blow, but it would hurt us." That said, executives have long bemoaned that the work in Iraq has cost the company. A 2007 shooting in Nisoor Square involving Blackwater guards drew outrage from politicians in Baghdad and Washington and demands that the company be banned from operating in Iraq. Late last year, prosecutors charged five of the company's contractors — but not Blackwater itself — with manslaughter and weapons violations. In January, Iraqi officials said they would not give the company a license to operate. In the meantime, Xe has been expanding into other lines of business. It has built a fleet of 76 aircraft that it has deployed to such hotspots as West Africa and Afghanistan. The firm continues to expand training for law enforcement, with a renewed focus on international clients. Last year, some 25,000 civilians, law enforcement and military personnel were trained by the company. Prince founded Blackwater with some of his former Navy SEAL colleagues. The company is headquartered in Moyock, about 150 miles northeast of Raleigh.